In what will be a special week-long theatrical run at MoMA in NYC - for which the filmmaker, Mati Diop, will be present - two of her films ("Atlantiques" (2009) and "A Thousand Suns" (2013)) will be paired, along with the seminal 1972 film, "Touki Bouki," made by her uncle, the late Senegalese auteur, Djibril Diop Mambety. The week-long (January 20–27, 2015) run is a collaboration between MoMA and UniFrance Films, whose new initiative, Young French Cinema, promotes emerging French filmmakers in North America in partnership with the Cultural Services of the French Embassy. "Touki Bouki" will also be shown 3 times over the course of the week-long theatrical run, in a new digital restoration by the World Cinema Foundation. Meanwhile, Mati Diop's "Mille soleils" ("A Thousand Suns"), explores the legacy of "Touki Bouki," as she journeys in search of her origins through the footprints left by the film her late uncle made, and along the way gets to know "Touki Bouki's" 2 main actors, 35 years later. Based on his own story and script, Djibril Diop Mambéty reportedly made "Touki Bouki" with a $30,000 budget. 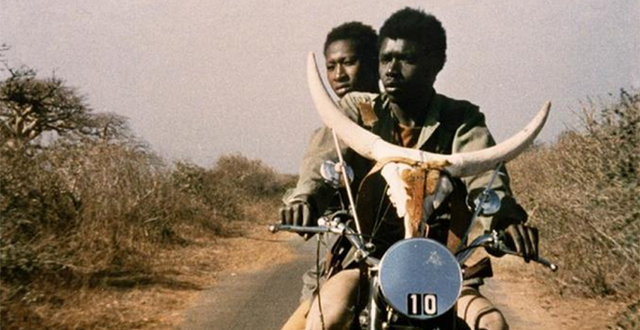 Often compared to films of the French New Wave, Mambety puts his stamp on a film that incorporates stylistic flourishes that were considered uncharacteristic of most African films at the time. The film both highlights and struggles with the hybridization of Senegal. There's an insolence that’s expressed in it, we could say, a freedom from formality, as well as a great sense of humor. As his niece Mati Diop has insisted, it’s also the film where her uncle reveals himself the most. Her exploration of "Touki Bouki" is an interesting, worthwhile watch. I don't believe a documentary has ever been made that celebrates the film, and considers its legacy, given its significance in African cinema history. It's a film (and I could name several others) that really deserves its proper restoration and re-release in HD, preserving, but also reintroducing it to new generations, and those who are just not aware of it. Mati Diop studied at Le Fresnoy (National Studio of Contemporary Arts) and Le Pavillon (an art residency of the Palais de Tokyo). Her films have screened worldwide to acclaim. If you'll be in NYC this week, from January 20–27, 2015, add this week-long run to your calendar. Check out the list of screening days and times for each film here.